The Birds (1963) is a modern Hitchcock thriller/masterpiece, his first film with Universal Studios. It is the apocalyptic story of a northern California coastal town filled with an onslaught of seemingly unexplained, arbitrary and chaotic attacks of ordinary birds - not birds of prey. Ungrammatical advertising campaigns emphasized: "The Birds Is Coming." This Technicolor feature came after Psycho (1960) - another film loaded with 'bird' references. Novelist Evan Hunter based his screenplay upon the 1952 collection of short stories of the same name by Daphne du Maurier - Hitchcock's third major film based on the author's works (after Jamaica Inn (1939) and Rebecca (1940)). In du Maurier's story, the birds were attacking in the English countryside, rather than in a small town north of San Francisco. It was shot on location in the port town of Bodega Bay (north of San Francisco) and in San Francisco itself. The film's technical wizardry is extraordinary, especially in the film's closing scene (a complex, trick composite shot) - the special visual effects of Ub Iwerks were nominated for an Academy Award (the film's sole nomination), but the Oscar was lost to Cleopatra (1963). Hundreds of birds (gulls, ravens, and crows) were trained for use in some of the scenes, while mechanical birds and animations were employed for others. Initially, critics were baffled when they attempted to interpret the film on a literal level and measure it against other typical disaster/horror films of its kind. The typical Hitchcock MacGuffin was the question: Why do the strange attacks occur? The main inspiration for the film's bird attacks came from mysterious, real-life avian deaths occurring in the summer of 1961. Thousands of disoriented seagulls suicidally flew into houses along the Monterey Bay coast line, further south of San Francisco. Scientists at LSU finally discovered that the deaths happened because the birds had been poisoned by a nerve-damaging toxin called domoic acid found in the birds' natural diet of anchovies and squid (that had both eaten plankton with concentrated levels of domoic acid). Scientists discovered that toxin-making algae was present in 79% of the plankton that the creatures ate. The acid caused bird brain damage, or at the least, created confusion, dizzyness and seizures. The acid had possibly come from leaky domestic septic tanks in the area rather than from suspected farm fertilizers. But the film cannot solely be interpreted in a scientific manner, because as the actors in the film discover in the long discussion scene in the Tides Restaurant, there is no solid, rational reason why the birds are attacking. They are not seeking revenge for nature's mistreatment, or foreshadowing doomsday, and they don't represent God's punishment for humankind's evil. When this is understood, the symbolic film's complex fabric makes more sense, especially if interpreted in Freudian terms. It is about three needy women (literally 'birds') - and a fourth from a younger generation - each flocking around and vying for varying degrees of affection and attention from the sole, emotionally-cold male lead, and the fragile tensions, anxieties and unpredictable relations between them. The attacks are mysteriously related to the mother and son relationship in the film - anger (and fears of abandonment or being left lonely) of the jealous, initially hostile mother come to the surface surface when her bachelor son brings home an attractive young woman. Curiously, the first attack has symbolic phallic undertones - it occurs when the man and woman approach toward each other outside the restaurant in the coastal town. 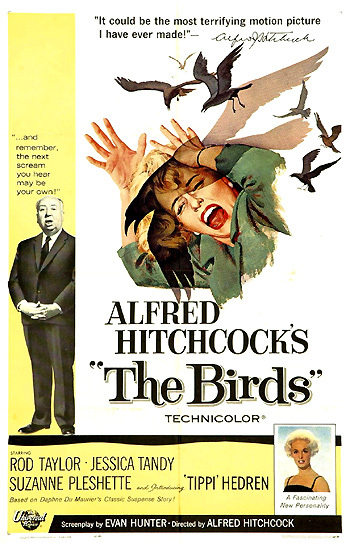 On an allegorical level, the birds in the film are the physical embodiment and exteriorization of unleashed, disturbing, shattering forces that threaten all of humanity (those threatened in the film include schoolchildren, a defenseless farmer, bystanders, a schoolteacher, etc.) when relationships have become insubstantial, unsupportive, or hurtful. In a broader, more universal sense, the stability of the home and natural world environment, symbolized by broken teacups at the domestic level, is in jeopardy and becoming disordered when people cannot 'see' the dangers gathering nearby, and cannot adequately protect themselves from violence behind transparent windows, telephone booths, eyeglasses, or facades. Numerous allusions to blindness are sprinkled throughout the film (the farmer's eyes are pecked out, the children play blindman's bluff at the birthday party, the broken glasses of the fleeing schoolchild, etc. ), giving the hint that the camera's voyeuristic lens (and its screen-viewing audience) is also being subjected to assault. The film commences on a white background, as dark black, silhouetted bird-shapes rush through and destroy the robin's egg-blue credits as they appear, accompanied by upsetting noises of screeching flapping sounds and bird cries. The action of the film occurs over a five-day period, from a Friday through a Tuesday morning. [Friday] The story officially begins in downtown San Francisco with a view of a cable car, as an attractive, elegantly-dressed (obviously rich) and coiffed, high-heeled blonde woman with a black suit crosses the street at Union Square. She passes a newstand with a poster of the city's landmark, the Golden Gate Bridge. After hearing a sexist 'wolf-whistle' [or more appropriately, a bird-whistle!] directed her way, she vainly turns in its direction and appears self-consciously pleased rather than insulted. However, one look upward and she becomes uneasy as she sees ominous, menacing swarms of seagulls beginning to darken the sky. On her way into the Davidson's Pet Shop, she passes an exiting customer [Alfred Hitchcock himself in his customary cameo] being guided and pulled along by a pair of terriers [Hitchcock's own dogs Geoffrey and Stanley] on leashes. Inside the shop, caged birds in ornamental cages are screeching and cheeping. Melanie: Have you ever seen so many gulls? What do you suppose it is? Mitch: Doesn't this make you feel awful...having all these poor little innocent creatures caged up like this? Back in your gilded cage, Melanie Daniels. Mitch: We met in court...I'll rephrase it. I saw you in court...Don't you remember one of your practical jokes that resulted in the smashing of a plate-glass window?...The judge should have put you behind bars. Melanie: What are you, a policeman? Mitch: I merely believe in the law, Miss Daniels...I just thought you might like to know what it's like to be on the other end of a gag. What do ya think of that? Although she is exasperated by him, she is also curiously attracted and impulsively decides to run after him - glimpsing his Ford Galaxie license plate number: WJH 003 as he drives away. Imperiously using the pet shop phone, she calls Charlie - a journalist/acquaintance at the Daily News, who works at the City Desk (and for her father, an executive). With her sophisticated feminine wiles ("Why, Charlie darling, would I try to pressure you? "), she coaxes him into calling the Department of Motor Vehicles to identify the owner of the car. Forgetting her own mynah bird order, she orders a pair of lovebirds that Mitch wanted to buy - and leaves. [Saturday] In the next scene, Melanie (viewed from the waist down and wearing an elegant, full-length beige mink coat) carries a gold birdcage with two green, yellow-headed lovebirds into an apartment elevator where the camera remains stationary on the feet of a man in the elevator (Richard Deacon). While the elevator ascends, the camera pans up the length of his body, and catches him looking down at the two caged creatures and then pans over to her tense, bird-like posture. [She is blonde-headed with a green dress - parallel to the colors of the lovebirds.] On the same floor, he follows her down the hallway - suspensefully - and watches her place the cage next to an apartment door, with an envelope addressed to: "Mr. Mitchell Brenner." The elevator occupant, Mitch's across-the-hall neighbor, informs Melanie that "he's not home...he won't be back until Monday, I mean if those birds are for him...I don't think you should leave them in the hall, do you?" Customarily, he spends his weekends in Bodega Bay - "up the coast about sixty miles north..." Her idea was to give Mitch a gift of something that would remind him of her (from their encounter in the shop and his labeling of her as a bird in a gilded cage) - and possibly to avenge his insulting treatment. But now that he's unpredictably absent, Melanie - on impulse - drives the winding Pacific Coast country road - with the lovebirds on the floor of her convertible sports car tilting in unison through turns - as she accelerates northward. In the General Merchandise/Post Office store in Bodega Bay, she mimics Mitch's first words to her: "I wonder if you could help me" when asking the friendly, accommodating postal clerk (John McGovern) (in a caged-off, claustrophobically-cluttered section of the store) where Mitchell Brenner can be located. She is told that he lives "right across the bay there...in the white house...that's where the Brenners live." Melanie is relieved to learn that Mitch isn't married. He lives in the house with his mother Lydia, and his sister: "just Lydia and the two kids...Mitch and the little girl." Rather than taking the road "around the bay to the front door," Melanie wants to take the more direct route "to surprise them," so she decides to soon rent an outboard boat by the Tides Restaurant and "cut right across the bay to their dock." He asks, dubiously: "Have you ever handled an outboard boat?" She responds confidently: "Oh, of course." You go straight through town until you see a little hotel on your left. Then you turn right there...Near the top of the hill, you'll see the school and just beyond a little house with a red mailbox. That's where Annie Hayworth, the schoolteacher lives. You ask her about the little Brenner girl. This tilling of the soil can become compulsive, you know...Well, it's something to do in your spare time. There's a lot of spare time in Bodega Bay. Annie: (noticing the birds) Oh pretty! What are they? Annie: I see. (pregnant pause) Good luck, Miss Daniels. She stands behind her red mailbox and watches pensively as Melanie drives away. During a slow dissolve between scenes, a sharp-tipped fountain pen in Melanie's left hand on the left of the screen, while she writes "To Cathy" on an envelope, is pointed directly toward Annie's face on the fading right side of the screen. After she parks at the waterfront dock (license plate RUJ 655 - an obvious bird pun: "Are you Jay? "), covered with fish-catching cages/nets, she rents a skiff from a quizzical fisherman (Doodles Weaver) who holds her birdcage as the inappropriately-dressed young woman from the city descends into the motorboat. Large, billowing clouds fill the sky as the tiny boat crosses the open bay (back-projected scenery behind Melanie's figure looks unnatural and unreal). A flock of gulls rest on the water's surface in the distance, and faint bird sounds appear on the soundtrack. To avoid detection, she switches off the motor and paddles in, watching Mitch enter a large red barn on his land's property. At the Brenner's landing-stage, the camera presents restless, point-of-view tracking shots as she sneaks up into the house to deposit the cage of lovebirds in the living room. She tears in half the envelope to Mitch and leaves the card for Cathy perched next to the gift. Stealthily, she returns to the boat at the dock, as the scene reverses itself and tracks backward. Melanie paddles out a bit, crouches down in the boat next to the metallic outboard motor to hide so that she cannot be detected, and voyeuristically watches Mitch enter the house and quickly run back out - perplexed by the appearance of the lovebirds. Melanie's practical joke is undetected so far! When he notices the boat, he races into (and then out of) the house. Squawking seagulls swoop down between them as he raises the gigantic field-glass binoculars to his eyes to see more clearly. He grins when he sees and recognizes her, jumps into his car, and races her speeding motorboat back to Bodega Bay on the open, vulnerable water.